The call credit spread is a bearish to neutral options trading strategy that capitalizes on theta decay and downward price moves in the underlying asset. It is comprised of a short call and a long call, and is sometimes also referred to as a “bear call spread.” The call credit spread option strategy also works in minimally rising markets, as the trade will be entirely profitable if the underlying asset closes below short call strike price at option expiration. Out of every online broker with 24/7 customer service in 2018, Ally Invest the has the lowest commissions to trade the call credit spread strategy as well as the best free options trading software. Read the Ally Invest Review. The net credit received for this trade is $0.30 ($30). The best case scenario for a call credit spread is for the underlying instrument, stock XYZ in this case, to move down or stay the same. If stock XYZ is anywhere below $53 at expiration (the price of the short strike), this trade would be a full winer. Note: for this trade to become unprofitable, XYZ has to rally $3.00, i.e. from it’s current price of $50 to $53. 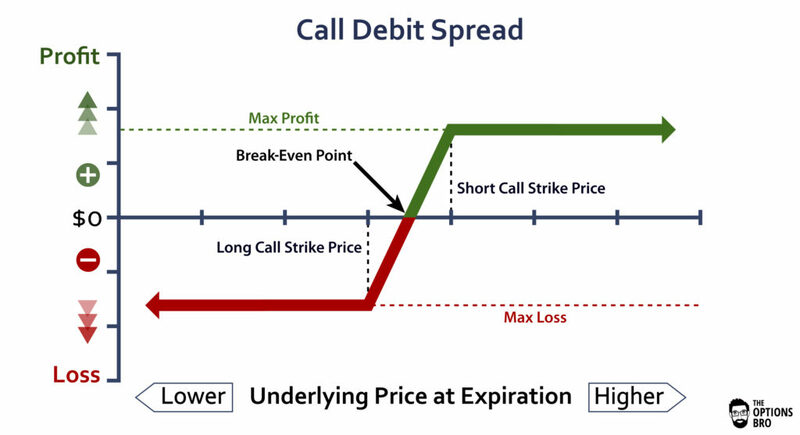 The break-even point for the call credit spread option strategy is always calculated by adding the net premium received to the strike price of the short call. It the case of XYZ, the stock can trade up to $53.30 per share at expiration before the call credit spread loses money. Why Trade Call Credit Spreads? Call credit spreads are fantastic trades to place if you want to take advantage of time decay and limit the potential max loss for the position. This is truly where the call credit spread option strategy shines. If if the underlying asset rises slightly, the position will make money, depending on how far OTM the credit spread is. If the underlying asset doesn’t move at all, the position will make money. And, of course, if the underlying asset completely crashes or moves down slightly, the position will make money. Essentially, call credit spreads are a hedged version of the short call option strategy. In fact, many traders initiate a short call and later hedge the position by purchasing a long call. This is know as “legging in” to a call credit spread. The primary goal with a call credit spread is to capture all of the premium received from placing the trade, so the main reason traders implement this strategy is to express a truly bearish perspective. 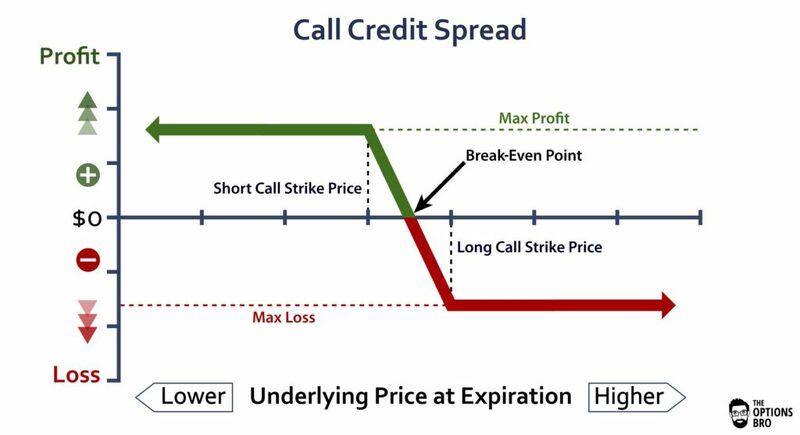 Since this is a risk-defined trade, the amount of buying bower required to employ the call credit spread option strategy is always equal to the max loss minus the premium received for placing the trade. In the case of XYZ, the margin requirement is $170, which is the max loss. Theta decay works in favor of a call credit spread. Regardless of the direction the underlying asset moves, time premium will come out of the short option leg of trade. The long call, however, will also lose value do to time decay. Since the long call is always further away from the short call, theta decay will always be greater for the short call and therefore offset the theta from the long call. When should I close Out a Call Credit Spread? As a general rule, call credit spreads should always be closed out when the premium for the spread approaches zero before expiration. A great tactic eliminate risk for an already profitable call credit spread is to only close out the short call part of the spread. You can leave the long call on, because it will typically be worthless so there is no point in selling it for $0.01. In essence, the remaining long call becomes a free-ride. Closing out the call credit spread option strategy by closing the short call first is known as “legging out” of the spread. As with all vertical options spread strategies, there is always a risk that the underlying asset will fall between the short and long strikes of the spread at expiration. If the short call expires in-the-money and the long call expires out-of-the-money, a potential assignment risk exists. Technically, an assignment risk exists for stock option sellers anytime a short option is ITM, although this is very rare. Your options broker will likely notify you of any expiring options positions that would cause a negative margin impact on your account, but don’t rely on other people to monitor your account. You can mitigate expiration risk by monitoring call credit spreads that are near-the-money the day of expiration. The call credit spreads is a really interesting options trading strategy. Essentially, it’s very similar to trading a short call, except there is an added hedge of a long call. This means there’s a limited max loss for the trade. For traders who don’t want to take on the risk of a naked option position, but still want to capitalize on premium decay, call credit spreads are the perfect solution. As with all options spreads, exchange fees and commissions can quickly add up, so always be mindful of how much you have to pay in transaction costs for opening and closing spread trades. If you can reduce your commissions, you can increase your profits for all options spreads, because a call credit spread is always a defined profit trade. Ally Invest is the cheapest broker to trade call credit spreads. Up to $3,500 cash bonus + commission free trades for new accounts.